The image on the left can be clicked to view larger. It’s a cropped screenshot of an email I got from Amazon. 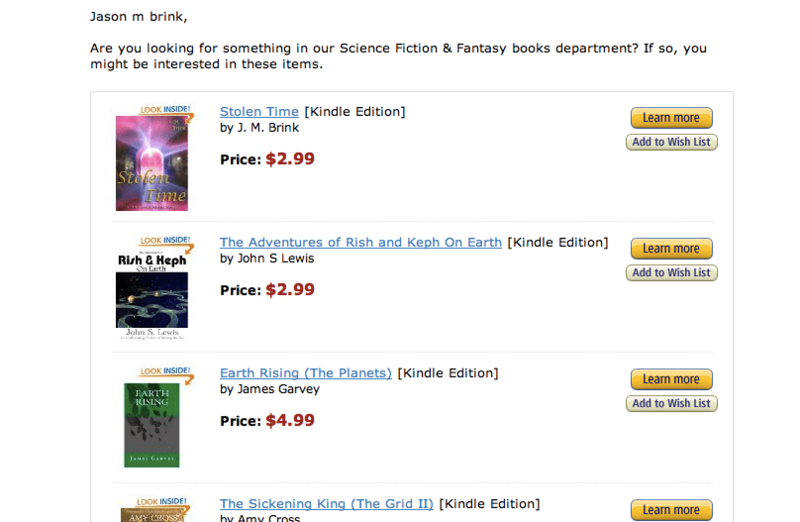 As you can see it is recommending I try Stolen Time‘s Kindle edition. Why is this not impressing me with their intelligence? That email address is the Amazon acct from which the book is sold, and I own a copy of the Kindle edition on that account already … through them … so they kind of should know about it. This entry was posted in Random Bloggy Stuff and tagged Amazon, Amazon Kindle, Amazon.com, Business, E-book, Email address, Kindle, Website by J. M. Brink. Bookmark the permalink.